Home » Hairloss Restoration Both Sexes » Miracle Hair » Miracle Hair Review – How Does Miracle Hair Work? What Are the Results? Only Here! What Is Miracle Hair ? 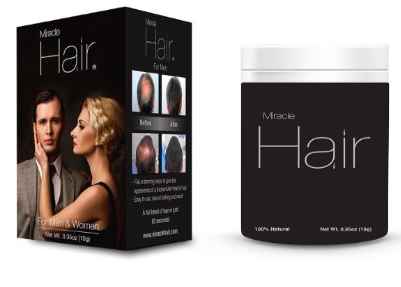 Miracle Hair is sold as a natural non-toxic formulation for balding and thinning hair. 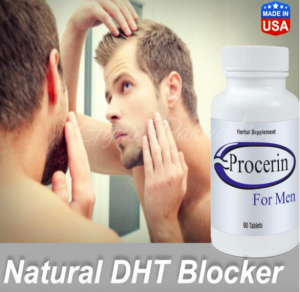 It promotes to be a revolutionary hair thinning solution by Evergreen Research & Marketing and what it should do is to handle balding/thinning and creates a thicker, fuller and a healthier hair. According to the details found, the formula employs fiber technology to make the formula natural, weather resistant and to last all day when applied. Miracle Hair is said to dramatically fortify the hair density and volume while providing a totally undetectable coverage to users’ thinning and balding areas. The manufacturer shares that the formula is easy to use as it completely eliminates the need for embarrassing hair pieces and/or expensive surgery. In line with the manufacturer’s details about Miracle Hair, all we need to do is to simply sprinkle the formula on the thinning or graying areas of the head. Then, part the hair gently to blend the fibers with our natural hair. We should see noticeable results in less than 60 seconds, according to them. It is available in different color and the recommendation is that we choose a shade darker than our original color for best results. It can be used together with any other hair enhancer, but the hair treatment should be applied first. The formula is available online on the manufacturer’s official website and in other third party websites. It seems the manufacturer offers some reasonable guarantee. According to the manufacturer, Miracle Hair is made from natural fibers. A rundown of the ingredients should include Cellulose, Sodium Sulfate, Aluminate Silicate, Ammonium Chloride. It is a plant-based compound that does not contain any harsh chemical or dyes. The fiber is derived from cotton instead of an animal or synthetic base. Therefore, one can have a safe and natural look that should last all day. Follow down for more details ! How Does Miracle Hair Works? Instead of using a chemical binding agent, Miracle Hair is said to work with the principle of fiber technology and science. According to the manufacturer, the hair is positively charged naturally, and the fibers in Miracle Hair are negatively charged. The opposite charges make the fibers attach and firmly bond to the customer’s existing hair. This occurs as a result of the static electricity. Is it truly an innovative technology that changes the game? 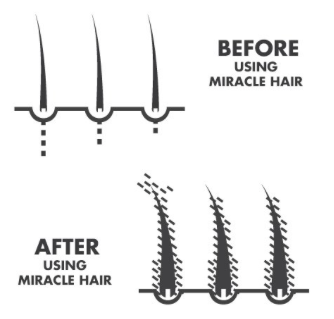 According to the Miracle Hair website, users can just gently sprinkle the product over the thinning area. They mention that in less than 60 seconds that one should have the appearance of thicker, fuller hair. They claim that it will blend seamlessly with the real hair as if it was there. Who Is Miracle Hair For? With reference to the manufacturer’s description of the product, Miracle Hair is specifically designed for men and women who want to address the problem of hair thinning. The makers claim that it will achieve a fuller, thicker and a healthy looking head of hair in this group of people. 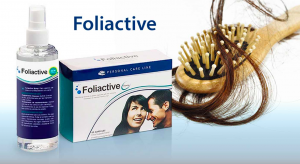 The detail about the product implies that it’s for folks who want to avoid using drugs, pills or surgery for hair enhancement. Miracle Hair is not for folks who want to re-grow their hair. It’s not for hair growth! The manufacturers of Miracle Hair promote to offer refunds to unsatisfied users of this product. That is, if within 30 days of using their hair formula, I am not satisfied with the result, I can easily contact them for a refund. Now from the webpage I found the Miracle Hair, on Amazon (www.Amazon.com/Miracle-Hair), they do cover terms and conditions. They provide plain packaging and discreet shipping of purchased products. They made the product purchase flexible in that one can choose from a wide range of options. See more details on that in the company’s website. They process international purchases and ship to P.O Box addresses. There are channels (phone calls and e-mail) in their official website through which we can contact them. 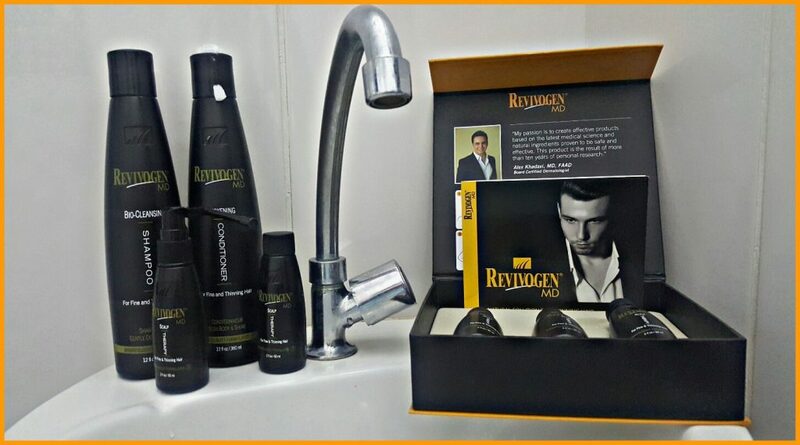 Having gone through the information about this hair formula, it is pertinent we conclude in line with the details gathered so far. Miracle Hair claims to be a fast solution to balding and thinning hair in men and women, yet no study is shown to support the product claims. It claims to offer a safe and natural solution to thinning hair. The refund policy for the product by the manufacturer is a good one, but there should be a significant number of positive reviews from previous users of the product in line with its claims. However, only few reviews were found and you can see them on Amazon website (www.Amazon.com/Miracle-Hair). Others are negative reviews and confusing/unanswered questions by prospective users of Miracle Hair. Evidently, a good friend of mines has had encounter with Miracle Hair for thinning and I can describe it as such. 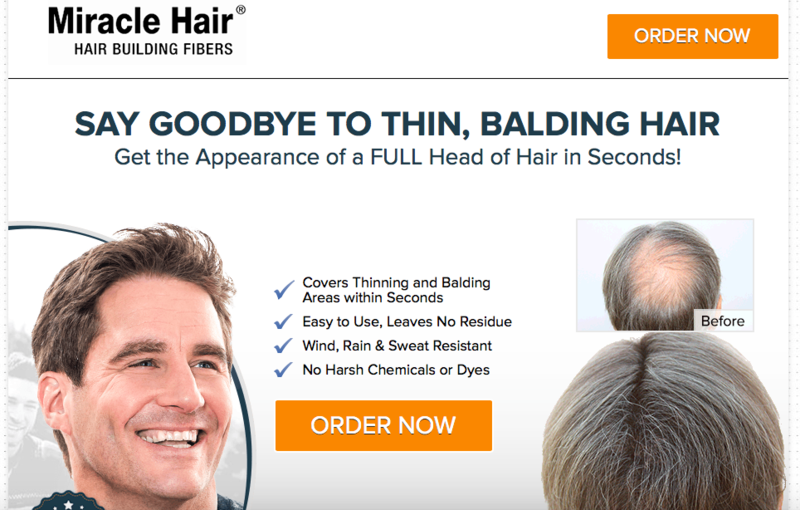 Because of the claims on achieving great results for hair balding and thinning, he really expected “miracle results” for hair thinning/balding. According to him, it did not help with any of these. There was no result and he just stop using it. We have to sit up right away and go for something else that is proven, out there like the Infinity Hair Fibers. 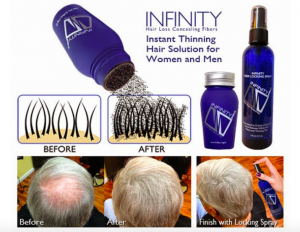 Not only I’m going to show before and after results from pictures proof and videos, but you will find out every detail you need to know about Infinity Hair Fibers here! Don’t miss this opportunity since I have reviewed many hair fibers out there and this one seems to be the really best one. Previous Post IRestore Laser Reviews – Does IRestore Laser Hair Work? Results Here at Review! Next Post KeraFiber Hair Review – Is KeraFiber Any Good? Do these Products Improve the Hair? Right Here!